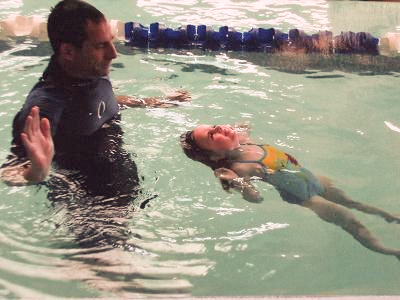 My goal in all of my children’s swimming lessons is to get the child to float and dog paddle (because they naturally can when they feel comfortable), then I teach proper form and stroke. I want them safe and swimming as fast as they can learn. Then I send them on to enjoy the water and impress the stuffing out of the folks at the local pool. My intention, as an experienced instructor, is not to keep the same kids in my children’s swimming lessons indefinitely or long term. Club USA swim lessons in Littleton are as simple as learning to ride a bike; once you get it, class is over (unless your goals are more advanced). Because I teach every class, availability is limited. My students graduate, usually in a few months, allowing me to concentrate on those who are still in need. If you as a parent believe all children’s swimming lessons are alike and the only difference is price, I invite you to come and observe one of my swim classes in Littleton. Bring your child, talk to some of the parents, and you will understand why I’m able to get kids excited to be in the water. Experience has taught me that this important life skill is easier and more enjoyable to learn than people expect. Parents are amazed when their child acquires new physical skills and achieves real personal accomplishments right before their eyes. To see children beam with pride and say, “I can!” is the greatest reward of this program. My swim classes in Littleton are so much fun for my students. They inspire balance, coordination, motor development, concentration, self-confidence, survival instincts, love of the water, and much more. Club USA swim lessons in Littleton with Mr. Kenn classes are held in the Club USA pool. Pricing and times are shown below. Kenn Schneider has been teaching for 18 years, teaching swimming lessons in Littleton for 12 years, teaching pre-school age children for 15 years. He is American Red Cross – Water Safety Instruction, Advanced First Aid, Advanced Life Saving, Adult, Child & Infant CPR, Ellis & Associates – Life Guard, Learn to Swim Instructor, Adult, Child and Infant CPR & AED, and Colorado State Registry of Preschool aged child care providers.